With the increasing failure rates, violence, immorality, and attacks on God in public schools, many believers are looking for an alternative when it comes to educating their children. Those that look into classical Christian education wonder how it differs from other types of education. Education that is classical is admittedly old. Some may fear that any appeal to an education that is classical must be inferior because it is not new. After all, isn’t real progress seen in the incredible technological advances we’ve been experiencing the last 150 years? This way of thinking is identified by the late British scholar C.S. Lewis as an example of ‘chronological snobbery.’ Those that reason this way say that what is new is good while what is old is bad. Both old and new things each need to be evaluated to see whether they are good or bad. What is the standard by which to judge whether an education is good? To answer this one must answer what the point of an education is. After all, it makes no sense to say a particular thing, for example a knife, is good or not unless you know what its purpose is. If one looks at a functional explanation, things that fulfill their purpose are good; those that don’t are bad. A good knife is one that is sharp and cuts well. A bad knife is dull. Similarly, a good education is one that both causes and equips a person to become a better human being leading them to ultimate happiness, i.e., God. A bad education corrupts mankind and leads away from the highest attainable goods. What are the elements of classical education that one can evaluate? There are several important marks that make an education classical, but three are evidently different from the public schools. These are the trivium, studying Latin, and reading primary texts. First, schools identifying as classical emphasize teaching what is called the trivium, namely grammar, logic, and rhetoric. More is entailed in the trivium than is immediately understood. Many of us remember learning grammar in school, how to think about things, and being required to explain our work in different contexts. The work many of us did that overlapped with the trivium did so accidentally. It is simply because of the nature of communication that we learned patterns of speech and thought from our parents, teachers, and environment. 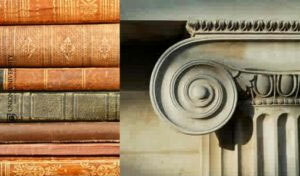 Classical schools intentionally work to improve these three areas as they are the foundation of the life of the mind. Philosopher Miriam Joseph explains: The trivium is the organon, or instrument, of all education at all levels because the arts of logic, grammar, and rhetoric are the arts of communication itself in that they govern the means of communication—namely, reading, writing, speaking, and listening. Thinking is inherent in these four categories. Reading and listening, for example, although relatively passive, involve active thinking, for we agree or disagree with what we read or hear. Reading, writing, and reckoning – though covered in both types of schools—are emphasized differently in Classical schools as they keep an intentional focus on the trivium. Second, classical schools emphasize that students learn Latin. Although the importance of Latin cannot be overstated, there are five noteworthy reasons to have students learn Latin. People undertaking a detailed study of Latin truly understand English grammar. This overlaps with an explicit goal of the trivium. Leaders in our society retain portions of Latin to communicate with each other (e.g., in medicine, science, and law). Learning Latin and its forms allows a student to imbibe a rich cultural heritage that has been shared with some of the greatest minds for the past 2000 years. It helps students score extremely high on the Verbal section of standardized tests (162 points higher than the national average on the SAT) leading to more possible money for college. This is possibly explained due to the fact that 60% of English words are derived from Latin. For the Christian, the majority of Christian thought has been written using Latin for the last 1600 years. These five reasons combine to provide a reasonable justification for (at the very least) teaching children Latin in school. Third, classical schools emphasize students reading primary texts. Rather than reading about a book, a classical approach makes sure students are exposed to the great works of some of the greatest thinkers that have lived. This differs from most public schools and even undergraduate programs. Rather than having textbooks written by others that tell you the thoughts of great works, students get to enjoy the thoughts in each book first-hand. For those of us that love teaching primary texts, we see it as the difference between telling someone how great something is versus bringing a student along to experience it (imagine someone telling you how good something tastes compared with actually getting to enjoy it yourself). This approach also means that of the scores of books in existence, students get to focus on only the greatest and most enduring. This shapes each student’s taste for quality work. What about the Christian component? It doesn’t take long to notice that not every classical school is Christian (some may say not every school that calls itself Christian is either). The classical Christian school has an edge over others. The reason is that there are certain things God has revealed about Himself (e.g., He is Triune, Jesus is God, God created the heavens and the earth, etc.) and the rest of reality that can help guide us as we evaluate different works. As believers there is the admonition to make right judgments and demolish arguments that are against the knowledge of God; there is also instruction to focus on the pure, excellent, and praiseworthy. These can be implemented as an important grid to help guide both teacher and student. The teacher is a support when the student struggles with the material until the student also learns through instruction and example how to stand firm. We see this classical Christian approach as providing a means to help us reach our chief end- to glorify God and enjoy Him forever.